On the heels a death at Club Philadelphia comes news of another death in a different Philadelphia bathhouse. This past Sunday (March 23, 2014) a 41-year old man was discovered with vital signs. He was discovered at 4:30 PM, three hours after he missed his 1:30 PM check-out time. 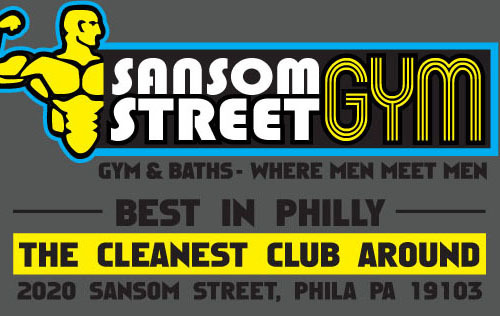 So far the police have noting to say other than it was a ‘sudden death.’ But the proprietor of the Sansom Street Gym seems to have plenty to say. They tell G Philly the death was not drug related. That the cause of death was a heart attack. Later on they released this statement. We regret to inform everyone that we did have an unfortunate passing at our facility this past Sunday afternoon. Out of respect for this person & his family we are unable to release the deceased name. Nevertheless, we have learned that it wasn’t drug related and that the deceased had a Coronary Heart Disease and passed away due to a heart attack. We send our heart felt condolences to the deceased family and friends.